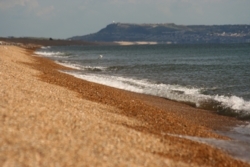 Chesil Beach is a beach like no other, whether you judge it by national or international benchmarks, it’s special! It’s not great for swimming and we don’t recommend you try. Nor is it any good for surfing and, for most of its length you wouldn’t, or couldn’t, launch a boat from it. 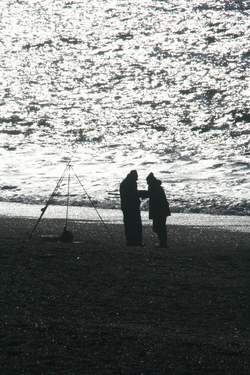 The beach is fantastic for fishing, but it isn’t just that which makes Chesil Beach so different from the rest. Chesil Beach is one of those rare phenomena, something that’s greatness stems simply from its existence - in short, it is great because it is there! Or perhaps, it is there because it is great! Either way, it’s well worth seeing. You won’t forget it and you won’t regret it. Locals, and others who know it well, implicitly recognise the unique magnificence of this 18-mile-long band of shingle. They drop “beach” and simply call it “The Chesil”, an affectionate and at times awe-inspired tag which recognises that whilst there are many beaches, there is only one Chesil and this is it. A tombolo is a thin strip of sand, shingle or rocks joining two bits of land together, which is exactly what the Chesil does with Portland and Abbotsbury. 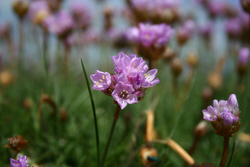 Many tombolos are quite small, jutting out a few hundred metres, but the Chesil is huge, probably the biggest and the best in Britain. OK, that’s all very educational, but what’s the attraction of visiting a beach you can’t swim off, sail off, surf on or make into sand castles? Simple. It’s beautiful, but not simply beautiful, beautiful in a very complex and moody way. Oddly, the Chesil is often at its best when the weather conditions are not. It looks as good, if not better, under leaden and stormy skies as it does under blazing sun. The Chesil is one of those landscapes you just can’t avoid. It dominates some of the best and most famous views there are of the Dorset Coast and is so big that it’s easily picked out on a map of Britain, in the same way you can point to Land’s End or the Isle of Wight! Viewed from Bridport’s West Bay, the Chesil sweeps away under East Cliff’s magnificent layered rocks towards Portland on the Horizon. Farther East, the perspective the Chesil adds to the often-photographed view from the top of Abbotsbury Hill also draws the eye towards Portland and makes a beautiful and ever-changing background to views of St Catherine’s Chapel. Viewed from Portland itself, the curve of the Chesil arcs across the shore of Dorset pointing down into Devon and, in the evening, away to the setting sun. These, and other viewpoints, give any spectator an excellent impression of the size and beauty of the Chesil, even so, its true majesty and mystery can only be appreciated from being on the beach itself. From here, you can see, feel, touch, smell and hear the magic of this massive shingle beach. Even before you set foot on the smooth rounded pebbles, you’ll be able to hear the pulsing roar of waves sweeping up and along the shore. In all conditions, except for the flattest of calms, the sound of water on shingle can be heard as waves curl their way around the edge of Lyme Bay. Often the Chesil-roar can be heard far into the beach’s hinterland, making camping at parks in the area especially relaxing. Don’t assume that it needs to be windy for the waves to roar. Often, it is in the most still conditions that the sound of the Chesil is most pronounced. Although the Chesil and Lyme Bay open into the English Channel, there is little between them and the Atlantic Ocean. Big, lazy swells lumber up the Channel from the Atlantic and rise imperiously when they reach the shore of the Chesil, crashing along its length in a boiling cascade of perfect-white foam. It is thought that waves, driven by the prevailing South Westerly winds, surge up the Channel from the Atlantic to hit and break on the Chesil at an angle. As each waves curls over, breaking continuously, a few metres at a time, along the length of the shore, they produce the phenomenon known as long-shore-drift. 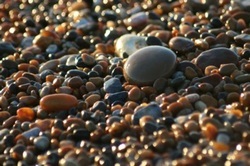 It is thought by many geologists and scientists that this is how the Chesil formed and is responsible for the differences in the size of pebbles as you move along it. To the West they are quite small, becoming increasingly large the farther East you go. It is thought that the action of the waves moves and erodes the pebbles at different rates as they are washed along the beach. Local fishermen are said to be able to tell exactly where they have landed their boats just from the size of the pebbles. An additional factor in longshore drift is the steep and sharply-shelving profile of the Chesil Beach. This can be seen to great effect when the tide’s low. Kids have great fun rolling themselves down the pebbles. But it is this same steepness which makes the whole of the Chesil treacherous for swimming. Some do towards the Western end of the beach, but even here there is a very strong under-tow even when the water is relatively calm. 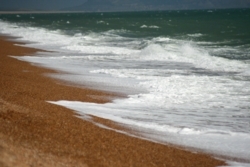 The Chesil is best viewed as being for fishing, walking, sitting, watching, listening and re-charging your batteries. Parts of the beach are popular with beach-casters. But there are plenty of other reasons to visit. Not least, it’s one of those rare places where it is possible to get a true impression of the huge scale and power of nature. And even on the busiest day, for those prepared to walk a little, it is always possible to find a peaceful spot to get a sense of perspective and wilderness. The main access points like, Abbotsbury, West Bexington, Cogden, West Bay and Ferry Bridge may get busy at times, but with 18 miles to choose from, there’s more than enough of Chesil Beach to go round! But before you ask, camping there is not allowed! 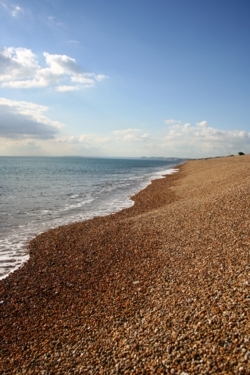 Chesil Beach is a beach like no other, whether you judge it by national or international benchmarks, it’s special!..​"